Additional Info: Michelle Klimchuk provides beautiful harp music for weddings, receptions, and special events. 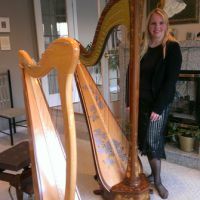 Michelle has been a professional harp player in Vancouver / Lower Mainland area for more than 25 years. She can add elegance to your special occasion with harp music. ​​From classical to the treasured old favorites to modern day popular and show tunes, Michelle Klimchuk plays the music you love to hear. Any occasion is enhanced by music from the harp with its enchanting sounds that caress the ear. The angelic soothing sounds of a harp at your special event is the perfect solution for every occasion. It adds an air of classiness to any event from a garden wedding, trade show, museum exhibit opening, business convention or maybe a small anniversary party. Professional full time harpist, Michelle Klimchuk is available for harp performances for all your special occasions in the Vancouver & Lower Mainland area of British Columbia and beyond.